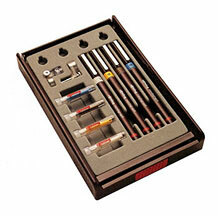 Features: Each set includes a pen holder for hand lettering and compass adaptor. 155743 Contains 4 stainless steel pens, sizes: 0.25, 0.35, 0.50 and 0.70 with 4 vellum ink cartridges. 155903 Contains 8 stainless steel pen sizes: 0.18, 0.25, 0.35, 0.5., 0.70, 1.0, 1.4 and 2.00 with 8 film ink cartridges. Each point is dual-designated (Standard/Metric) for quick identification.